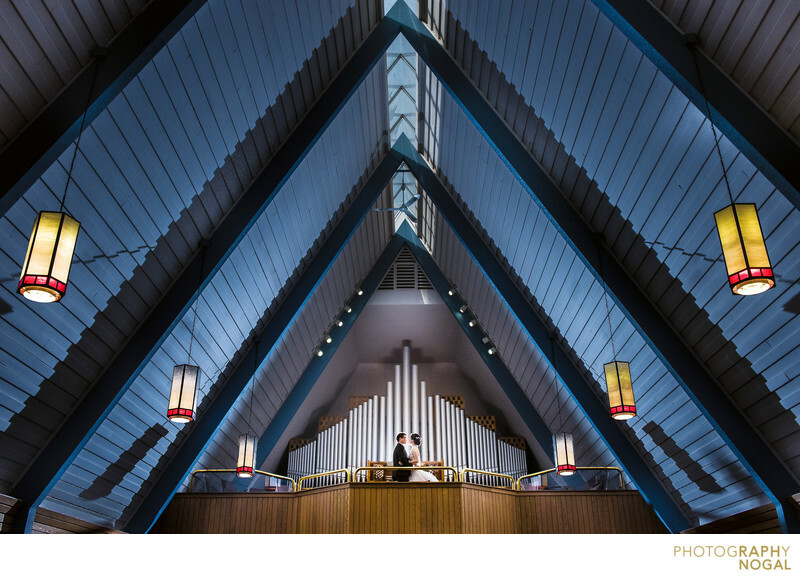 Making use of the bold architecture in St. Mary’s Anglican Church of Richmond Hill, Ontario, I photographed the bride and groom from the main floor while they stood on the organ balcony. The cathedral ceilings offered a natural showpiece to point the eye upwards at the couple. Additionally, the blue tint from the ceiling beams and yellow glow from the light fixtures created an attractive colour scheme. This photo was taken with a Nikon D750 DSLR at ISO 1600, f6.3 aperture, 1/1250th shutter speed with a Nikon Nikkor 24-70mm f2.8 zoom lens, at 31mm focal length. The lighting was a Profoto B1 OCF flash on a light stand behind the couple, utilizing high speed sync (HSS), bare head. It created a beautiful glow around the bride and groom and helped separate them from the background. Location: 10030 Yonge St, Richmond Hill, ON L4C 1T8.